We constantly hear about the balance between privacy and security or between privacy and law enforcement. It is a precarious balance, but service providers need to be mindful of their place in the balance. The Canadian general privacy law that is often the focus of this blog, the Personal Information Protection and Electronic Documents Act, addresses the role that the private sector can and should play in striking this balance. The short answer, if there is one, is that you are not a cop. The police have their job and are required to operate within the contraints of the law, including the Canadian Charter of Rights and Freedoms. The private sector gets to define its job, and it generally isn't law enforcement. The hubub over the change to Sympatico's terms of service is evidence that customers don't expect their service providers to act as agents of law enforcement (see: Canadian Privacy Law Blog: More fallout from Sympatico privacy upset). Actors in the private sector, such as internet service providers, often collect and retain information that may be useful for law enforcement or as part of private litigation. If you are served with a subpoena for personal information, you should resist the disclosure. 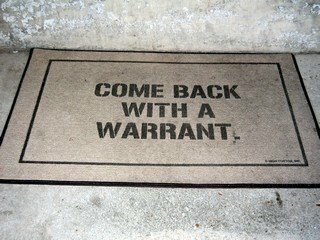 A subpoena is not a search warrant. In most jurisdictions, any lawyer representing any litigant can print out a subpoena and go to the court to get a fancy looking stamp on it. All a subpoena means is that you are required to attend at court with the information to have a judge make the final call. There may be no basis for the demand for information and your organization should avoid any situation where it has provided personal information that it was not legally required to hand over. When the internet service providers in the recent file sharing case resisted disclosure and took the matter to court, they emerged as staunch defenders of their users' privacy. That's certainly better than the alternatives. Credit to the [non]billable hour for the photo.